spoony for logophiles: axes, pack tests, spring break! wow. I'm extremely overdue on a new post on here. Sorry guys! 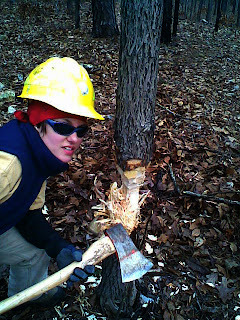 The latest news is that I'm still spending my weekdays at the same ol' Peck Ranch working on firelines and burning cedar slash... but now I'm teaching people how to use chainsaws (when they ask for coaching) and I've been working on my precision axing skills! Also, the weekend before Mardi Gras, I had my pack test and passed! The pack test is the last thing I had to do to get my Red Card, which will certify me to fight fires on federal land, or just outside Missouri. Yes, that includes out west. What I had to do was don a weighted vest that weighed 45 pounds and trek around a park a few times until I had completed 3 miles... all under 45 minutes. It's a test designed to make you work really hard for 45 minutes, so that if you're going to have a heart attack, you can get it out of the way safely, instead of on the side of a mountain while fighting a fire. My goal was to finish in 42 minutes and I finished in 42:18! This morning I intend to head over to the park and do the pack test again with the rest of my team because it was such a difficult, but refreshing workout. My goal for today is 40 minutes. 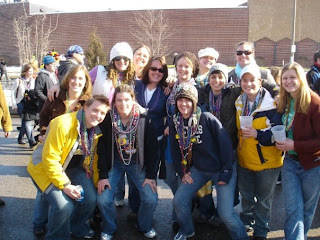 Mardi Gras was a system overload of fun. We saw the parade, got lots of beads, drank plenty of beer, had a dance party on the sidewalk and barbequed in the back yard. Good times, great friends. That Sunday, I spent most of the day laying around the house and finishing up laundry. It was a great weekend... and it got the little remaining bits of crazy out of my system for at least the next 6 months. Speaking of 6 months, This month marks my 6th month in AmeriCorps! I'm half-way finished!! Don't get me wrong, it's not that I'm starting a countdown, because I can't wait to get out of here... it's just that I can't believe I've gotten this far, this fast! I've learned so much and have gotten so much stronger in character and in body... I honestly can't imagine what the next 6 months will bring. My birthday is also coming up and I will be 22! I can't believe how fast time flies as I get older. When I was little, it seemed like decades passed between my birthdays, and now it's like the years are shrinking into blocks of 3 or 4 months. It's been over a year since I met Mrs. McNutt at the Summit... It's been almost 2 and a half years since I met Cody in San Marcos while he was on R&R... It's been almost a year since Tiffany's wedding, and it's been a year and a half since I adopted Ouizie, my beloved kitty. Next month, my sister, Claire, is coming up to visit me for spring break!! woot!! I got approval from both my bosses for her to come into the woods with us for a week and do conservation work alongside me! 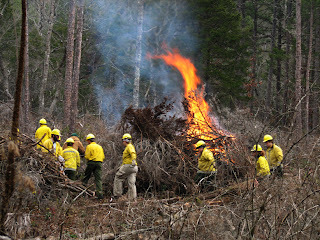 The higher up boss even said we might be able to get her level 1 fire training, so that, if need be, she can help us with prescribed burns! (I don't see when there would be time for that, so it's doubtful, but I'm still soooo excited!!) Claire is pumped too, but she's trying to work out the travel expenses and find out if her car will make it to St. Louis and back without a new catalytic converter. We'll see. Well, It's time for me to start stretching and getting ready for pack test #2. Much love to all! !